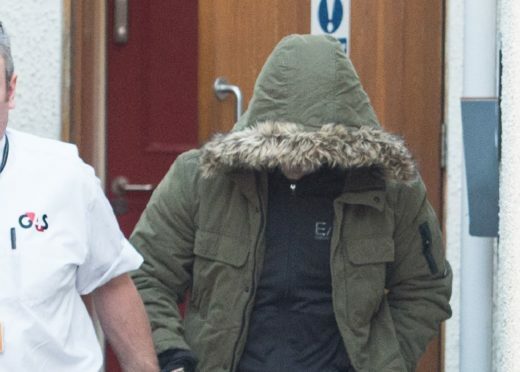 Liam Forsyth leaving Elgin Sheriff Court. Liam Forsyth, from Keith, brandished a rock at ambulance staff who were called to help him in New Elgin on December 21. The crews called police to Robertson Drive for assistance, who the 25-year-old then threatened to “infect” by spitting at them. At Elgin Sheriff Court yesterday, Forsyth was returned to prison to serve the unexpired portion of an eight-month sentence for another offence involving police officers. Fiscal Alex Swain said that Forsyth’s acquaintances, Sadie Ross and Darryl Wood, called ambulance staff for him after becoming concerned about a cut to his head. She added: “While in the kitchen the accused made to grab a bottle of vodka, which Ms Ross took from him. “He then grabbed a bottle of Buckfast and raised it over his head and started to swing it around. Forsyth was pushed outside of the property, which is where he was when ambulance staff arrived at the scene shortly after midnight to treat him. However, despite his injury, he immediately started shouting at them and started “swinging a large rock”. Police were also shouted at as they took him to Elgin police station. Defence solicitor Stephen Carty stressed his client should be spared a prison sentence due to improvements made in his life recently. Forsyth, from Keith, was returned to prison to serve 243 days from his previous sentence. He was also jailed for a further 146 days for the offences from December 21, which included acting in an aggressive manner against Miss Ross and Mr Wood, assaulting, obstructing or hindering ambulance staff by shouting, swearing and brandishing a rock at them and shouting, swearing and threatening violence at police officers.